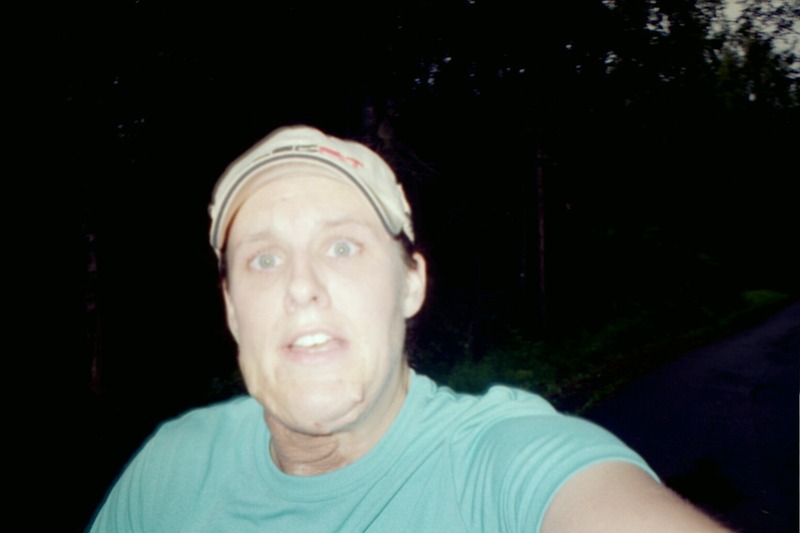 Eight years ago in August 2007, I traveled to Alaska to run a marathon (my 4th). This was the age before smart phone mania (the first generation iPhone had just been released), and really before real-time updates via hashtag became a national phenomenon. Curious about the marathon’s warnings of potential moose encounters, I didn’t want to be left without proof if such an encounter occurred. Since I also lacked a pocket-sized digital camera, I stuffed a disposable 35mm camera in my pocket (#oldschool) for the course that followed the Tony Knowles Coastal Trail in Anchorage and hoped for the best. The race started out well enough, but as anyone who has run a marathon will tell you, it’s a long race. It was a lonely run on the trail with few spectators, but that didn’t bother me. Achieving a specific time wasn’t a goal–I chose instead to focus on the beauty that surrounded me, counting down the miles one-by-one. I really wanted to see a moose. But instead of a moose, I got horrible leg cramps. There were no moose and no other wildlife sightings, but I did take a few pictures along the way. Some of them actually turned out. Even after the pain in my legs persisted for miles, I turned again to the scenery, which helped me remember that it was a great experience in spite of the pain. At the start. Humpy’s Ale House marathon. I had arrived in Alaska a week before and made a whirlwind excursion from the Matanuska-Susitna Valley to the Kenai Penninsula, and up to the Interior to Fairbanks. Alaska is huge, and amazingly beautiful. Traveling those thousands of miles in a short amount of time meant I spent many hours in the car. Perhaps that’s why my legs cramped up during the marathon. Nevertheless, it was all worth it–even suffering the pain. A year later in 2008 I was back in the Last Frontier, but not to run a marathon. The same friend who drove me around the huge state the year before was moving out to the lower 48 and, being a good friend, I accompanied him on the only road leading out of Alaska into the Yukon Territory. The best part? Going from the Yukon Territory back into Alaska to ride the Alaska Marine Highway ferry boat from Skagway, AK to Prince Rupert, BC. The ferry’s solarium deck became our shelter, providing awesome views right from our sleeping bags. There’s nothing like waking up to the snow-capped peaks of Alaska’s Inside Passage. Similar sentiments to my “Why am I doing this?” could be expressed about travel itself. Perhaps many travelers, in the midst of lost luggage or canceled flights have asked, “Why the hell am I doing this?” In those moments it is best to remember the experience of beauty and learning that comes along with travel. Even though there’s pain, I hope you won’t regret it.